MELBA’S RING was the first to be released on 5.1 Super Audio CD. Critics were unanimous in their praise of the fidelity of the recorded sound to the performance. 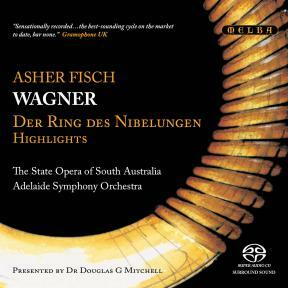 The Fanfare [USA] critic said: “Finally, for audiophile Wagnerians, here’s a no-brainer ... Asher Fisch presides over a well-prepared Adelaide Orchestra ... world class. And the sound! 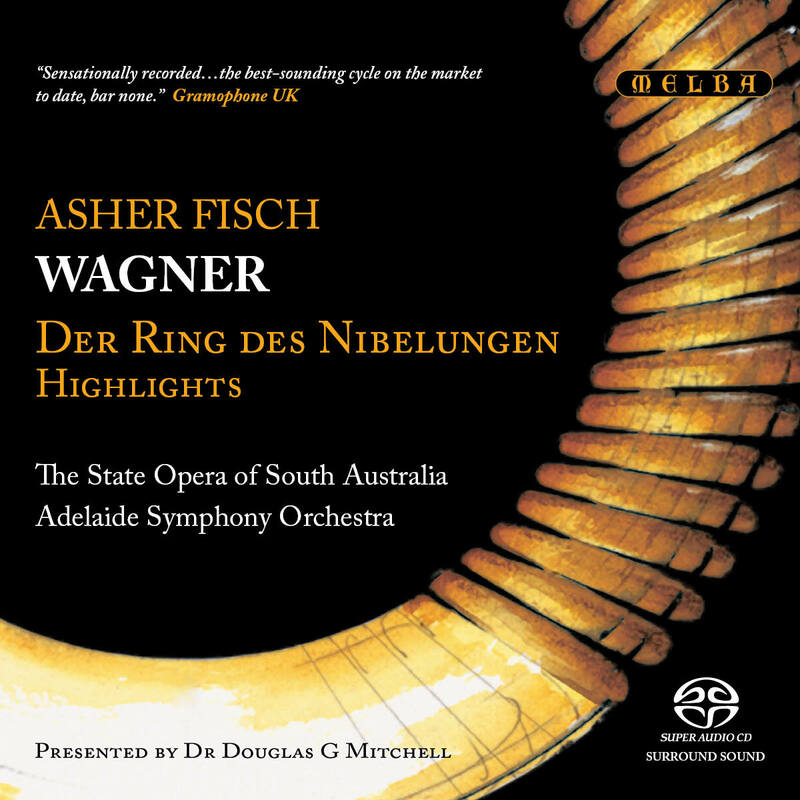 The 5.1 multichannel program renders the richness of Wagner’s orchestral syntax as you’ve never heard it outside of a good opera house ...”. Melba is pleased to offer highlights from the complete 2004 SOSA Ring Cycle on 2 Super Audio CDs again on 5.1 Super Audio CD surround sound, also compatible with normal CD players. Highlights include Lisa Gasteen's majestic performance as Brünnhilde, John Bröckeler in Wotan's touching farewell, the barnstorming Ride of the Valkyries, Siegfrieds' Funeral March and many more. Click here to read Peter Bassett’s essay of the history of the Ring in Australia. ‘Mark well my new poem – it contains the beginning and end of the world!’ boasted Wagner to his friend and champion Liszt. At the start of Der Ring des Nibelungen he wanted to show the beginning of music and language as well, but was completely on his own for sources in poetry and drama. So he looked back to his own Siegfried’s Tod, the original version of Götterdämmerung for which he had written a libretto in 1848. Inventing a forerunner to his scene there of Siegfried and three ‘watermaidens’, he mixed that together with the creation story from Genesis in the Bible to create a watery Garden of Eden opening. A serpent (the Nibelung dwarf Alberich) persuades three Eves (the Rhinedaughters) to give up their secret – if not their virginity – so that the apple (the Rhinegold) may be stolen. Two principal themes of the whole Ring poem are immediately set out here: the conflict between power and love, and the spoiling of nature by mankind. Wagner’s ‘new’ poem naturally needed a new music too. ‘Just imagine’, he told Liszt almost truthfully, ‘the entire instrumental introduction to Das Rheingold is built upon the single triad of E flat major’. He also indulged in some operatic in-jokes, setting the Rhinedaughters’ slinky cavorting in the river and their alternation of solo and trio work to parodies of the old-fashioned set-pieces of Meyerbeer and Auber still so popular at the Paris Opéra, the Valhalla that Wagner had not yet managed to storm. In the style of his much read ancient Greeks, Wagner intended Das Rheingold to be the equivalent of the satyr play that followed a tragic trilogy in classical Athens – but with the comedy now re-situated as a prologue. Many of the jokes he incorporated were at the expense of the Nordic gods. Based on recent research by the Brothers Grimm, they were newly characterized, sometimes caricatured and shot through with a contemporary, human irony. Memories of Paris again and its sensational stage effects informed the composition of ‘Heda! Heda! Hedo!’, a grandiose little aria for the relatively minor character of Donner which ends in a storm of percussion and lighting cues. Truly a display of hollow pomp. The double story line of the next opera (the Ring cycle’s ‘first evening’) was reflected in its original title Siegmund and Sieglinde: the punishment of the Valkyrie. As human beings took the stage for the first time in the story Wagner produced his keenest work in a Ring libretto (it was also the last to be written). The old Norse tale of the brother and sister who become lovers to sire the greatest hero (Sigurd, or Siegfried) was fluently compressed from a complex of sources and genealogies. Wagner then turned to two favourite plays. The ruler’s daughter in Antigone who is punished for burying her brother by being walled up in isolation became Brünnhilde the Valkyrie punished for taking Siegmund’s side by being left asleep and unguarded on a mountain top. But the love between her and her father, the god Wotan, is of a King Lear/ Cordelia-like compassion. She is able to talk him into surrounding her with a fire that can be crossed only by a hero. The score of Die Walküre is less conventional than that of Das Rheingold. After the Prelude – a storm both in nature and of the Wälsung twins’ emotion – their first encounter anticipates that of Wagner’s Tristan and Isolde, lengthy string recitatives and massive silences. The expected love duet does develop to end the act – but according to Wagner’s new rules that he had written for himself before starting the Ring: no set-piece arias to hold up the drama (‘Winterstürme wichen den Wonnemond’ and ‘Du bist der Lenz’ are monologues moving seamlessly into the following music) and no joining together of voices. Later, both the run onstage of Siegmund and the crazed Sieglinde and the hero-collecting from the saddle of the Valkyrie girls (its distinctive rhythm already trailed in embryo in the aborted music for Siegfried’s Tod) show that Wagner was not wholly averse to providing musico-dramatic blood and thunder to ‘back’ the stage action. At the end of the opera the multiple climaxes and long wind-down of the music depicting the fire surrounding Brünnhilde – an early nod to, and significant influence on, French Impressionism – show how far Wagner had managed to integrate symphony and opera. In Siegfried – more than in the other Ring operas – we find text lifted almost wholesale from its sources, a new development for Wagner and an anticipation of the working methods of later 19th- and 20th-century librettists. Wagner’s now well-documented love of rough and tumble folk theatre led him to base his hero’s character on the more naive, more comic version of Siegfried offered by the Volsung Saga and Thidrek of Bern’s Saga. He could cherry-pick from a detailed account of the day-to-day life of the young orphan growing up with the malevolent foster-father he will later kill. Fouqué’s The Hero of the North, an early 19th-century German play about Siegfried, provided him with a ready-made three-act scenario of events. Like all classic heroes, Siegfried never knows his semi-divine parents and is brought up in the wild by a foster-father (Mime). He has been left a gift which will ensure his fame and fortune (the pieces of a sword). A tendency to rough behaviour (ill-treatment of Mime) leads him to seek adventure in the outside world (killing Fafner the dragon) in the course of which he acquires some supernatural knowledge (tasting the dragon’s blood lets him understand birdsong and hear Mime’s thoughts). He is ready to meet his destined partner who must be won by a final test of courage and strength. In Act III, when Siegfried is sexually aroused by the sight of the sleeping Brünnhilde, he wonders if this new emotion is fear – a trait of the hero’s that Wagner drew almost exclusively from the Grimm Brothers’ work. They alone had noticed the parallel between Siegfried’s nervous awakening of the sleeping Brünnhilde and the Sleeping Beauty fairy story. Yet it was only after the first draft of Siegfried was written that Wagner claimed to see (or confessed to) the link between his hero and their story The One Who Went Forth to Learn Fear. In Götterdämmerung this lack of fear – which implies a lack of true maturity (one of several areas where Wagner’s psychological characterization appears to anticipate end-of-the-century psychoanalytic research) – would prove Siegfried’s undoing. In the old sagas ‘Brynhild’ appears as a princess, often ferocious, of great physical strength (symbolizing purity and virginity), whose hand is sought as a prize by heroes and princes. Wagner gave her the character and pre-history of another Valkyrie, Sigrdifa (‘victory bringer’), who was punished with sleep for disobeying Odin. The final duet in Siegfried links the myth of Sleeping Beauty with that of a journey to the underworld to fetch back a soul from the dead. Having made his Brünnhilde the daughter of a god and a prophetess, Wagner was able to humanize her transition from abandoned goddess to awakened young woman with the awareness that she is now merely a mortal. There are a lot of songs in Siegfried, an effect deliberately in keeping with the folk nature of the piece. Mime complains in a ditty which drives Siegfried almost to violence; Siegfried has two work songs while at the forge then recalls his mother in the forest in what is almost a lullaby. Finally Brünnhilde attempts to explain her ‘eternal’ love for Siegfried in a two-verse arioso. And yet Wagner does not step backwards into ‘grand’ opera or break any of his own rules – the dramatic content dictates the musical one. Although Wagner had now given the character of Siegfried an entire, separate opera dedicated to his young adventures, he rewrote very little of the 1840s grand-operatic language that he had used in Siegfried’s Tod, the original (and largely uncomposed) Götterdämmerung. He realized how this essentially French grand operatic ‘speak’ could work well in the soulless and materialistic Gibichung court on the Rhine, making the maximum contrast with the heroic saga world of Brünnhilde and Siegfried and their links to the gods. Siegfried himself would be well established as a character and could take on the tragic resonances of the heroes from which Wagner had formed him – Achilles and Baldur – when surrounded by the mundane (and, again, French grand operatic) plotting of Hagen and Gunther. The writer Thomas Mann once praised the Ring for being like one of the great new novels of the 19th century. Wagner handled his story and characters much in the manner of a modern novelist or film scriptwriter. There was no slavish reliance on a handful of sources to be marginally adjusted, or romanticized, to make way for music – the libretto ‘manufacturing’ that Wagner despised – but a compendium of text and dialogue sifted through the writer’s current philosophical and social concerns. There was no gap between writer and creation: the changes in Wagner’s own beliefs were immediately incorporated into the Ring, one of the reasons why the work took so long to complete and, at a more local level, one of the reasons why he tried so many different versions of the ending.